"On the shore of the great ocean is a large palace that glows with the effulgence of solid gold, and is topped by a towering temple spire that appears to be a blue sapphire mountain. 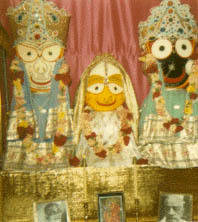 Residing therein along with His mighty brother Balabadra, and in between Them His sister Subadra, Lord Jagannatha bestows opportunities for all godly souls to render various devotional services. May that Lord of the Universe kindly become visible unto me."